We follow Least Toxic Pest Control Best Management Practices (BMP’s) for Insect and Weed Control Services for Lawns and Landscapes; we also provide Non-toxic Pest Control Service as well. Our team is committed to the safety of our customers, your family, and our Service Providers. We are proud to offer our Natural Care Option for homeowners. With Bio Green’s Natural Care Option, our service providers will use only the best, most effective, natural methods of controlling weeds, insects and diseases in your landscape. Each Natural Care Option is designed specifically for the varying needs of your property, since no lawn is the same; extra care is given to insure that the results are just what you are looking for. All of our Bio Green Options are based around Bio Green’s own natural, bio-based fertilizer products. 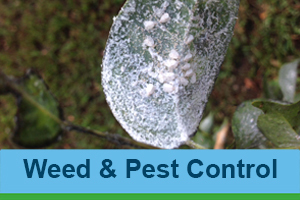 We also offer a more conventional approach to controlling weeds and other pests. As with all of our fertilization services, this option is centered around Bio Green’s own natural, bio-based fertilizer products. When choosing the Complete Care Option, your Bio Green Service Provider will use a “Least Toxic Pesticide BMP (Best Management Practice). This means that “least toxic” chemical options are utilized and no unnecessary chemicals are applied where they are not needed. Chemicals are only used on a case-by-case method and are NEVER blanket applied. You can feel safe and secure knowing that Best Management Practices are ALWAYS in effect. Got a weed or insect problem? Contact us!